Look what I just found….aren’t these magnificent!! Next Dye Your Easter Eggs Then SPRING CLEAN the House! I love tulips, but apparently not as much as the field mice or voles who eat the bulbs. Grow them in pots off the ground? Great idea! I should do that! Oh that’s sad. But the deer are happy campers. What a sight that must be. We actually have a love hate relationship with them. They are beautiful to see (especially momma’s with babies) but they can be very destructive when it comes to vegetation. There are a few things they don’t eat but we have learned to put fences around most things. I get it, I would probably feel the same. It’s too bad you can’t surround your veggies with the things they don’t eat! We have tried that but had limited success. Fences work best. Such a beautiful time of year…everything waking from the winter…people planting…wonderful time of the year! They are beautiful! My tulips are starting to peek from the ground and I hope to see them bloom before I move to Colorado! I’m moving in my forever home in September! I can feel your excitement! Fantastic tulips and they are looking gorgeous, Kelley. Too good. They are stunning!! 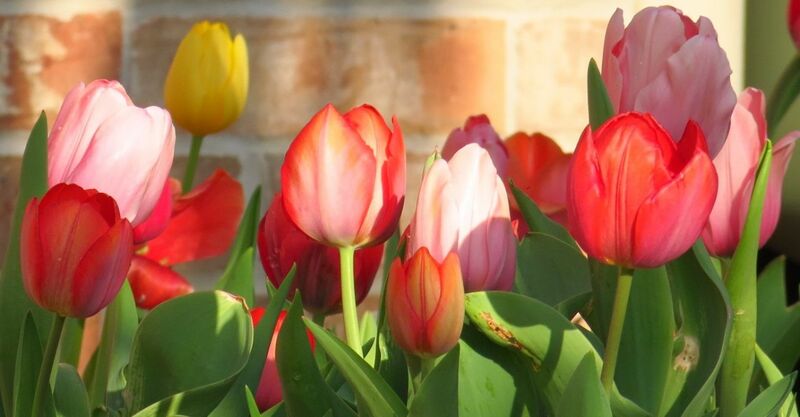 I love tulips…no chance growing here! Ah, no chance here either!